​With/without pull handles, push buttons, wheels, and backpack straps. With/without pull handles, push buttons, wheels, and backpack straps. Plus, we’ve squeezed in a few unique models that will get your kiddo’s eyes sparkle. Here’s our TOP Carry On For Kids that Makes the Entire Family Happy! But isn’t it wonderful how, these days, everyone can get their own luggage? Starting with the toddler and ending with the most responsible family member, packing for a trip can be a fun and enticing experience where everyone is involved. I get to be reminded of that whenever I see my adorable niece prepping her penguin toddler carry on luggage. 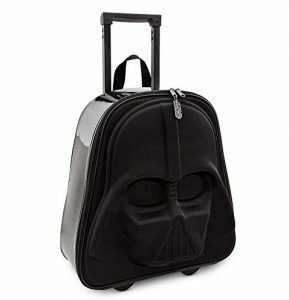 Or her elder brother with his Darth Vader suitcase for kids… Believe me, it’s all about sheer joy and so much more! So far, we showed it’s a good thing to have smaller and better-organized luggage, so everyone will know where to look for their belongings. 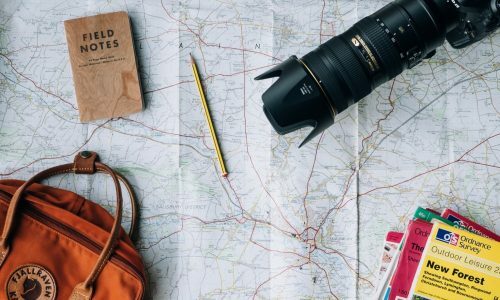 It’s also a great thing that it gives you the opportunity to plan the travel as a team, with the kids involved up to their ears. But how about you turn the preparation of the traveling bags for kids into a learning opportunity? ​Ultimately, prepare your family to travel with the kids as an active part of the process, not a sort of an extra luggage! Ultimately, prepare your family to travel with the kids as an active part of the process, not a sort of an extra luggage! ​Pssst… Have we Mentioned it Helps to Skip Checking the Bags? That’s right, more bags = smaller bags. You take the plane, pay for the child’s seat, and you’re entitled to an overhead bin. Separate their clothes from yours, shrink your bag and make it lighter, and you’ll pay less with these carry on's for kids! When Should You Buy Traveling Bags for Kids? If your child can walk, it is never too early to give them a tiny bag and a lesson of what it means to own something and be responsible for it. 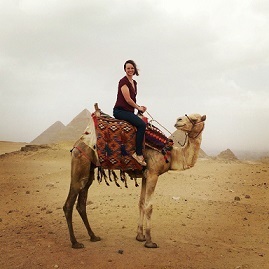 As they grow up, moving on from that first toddler carry on luggage to the best suitcase for kids, adjusting to their physical needs, will come naturally. Talk to your child and let them manifest their autonomy. Choose something that weighs no more than 10 to 15% of their body weight, with a design that they are truly happy with. And make sure, as much as you can, that the best rolling luggage for kids will also give you, the adult, a comfortable option to carry it when the child is really tired. Trust the Experts: Research Now, Explore the Fanciest & Most Practical Carry Ons for Kids. The Rockland 2 Piece Luggage set is our recommended kids travel backpack choice. Made of 100% 600D polyester, it features a range of 31 best kids luggage versions of colors and patterns. The funky, attractive design, the resistance to wear and tear, and the practical combo of upright bag and carry on for kids make it irresistible! The main bag from the Rockland 2 Piece Luggage set measures 19 x 13 x 8 inches, including 2 large front pockets and 3 internal pockets. With the ED-Roll in-line skate wheels, it easily competes for the best rolling luggage for kids. And next to its retractable handle, one can attach the 12 x 11 x 5.5 inches carry on flight tote bag. The second piece includes stability bars at the bottom, an adjustable, detachable shoulder strap with non-slip design, and padded handles. ​Both pieces, not just the carry on for kids, fit the cabin bag allowance dimensions. ​The positioning of the shoulder strap hooks can make the tote bag flip upside down. The positioning of the shoulder strap hooks can make the tote bag flip upside down. The J World New York Sunrise Rolling Backpack continues our best rolling luggage for kids series. Proving that the Rockland 2 Piece Luggage versions are far from overwhelming, it boasts a selection of 61 patterns of this kid travel backpack model! Pockets and models galore, child-friendly design details, it’s a must-have at any time of the year. 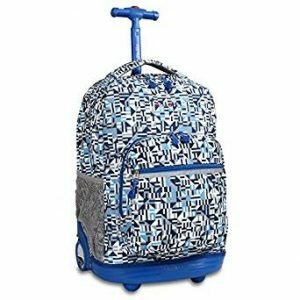 Most of the J World New York Sunrise Rolling Backpack carry on's for kids measure 9 x 13 x 18 inches. The polyurethane-coated bag has aluminum handle and flawless internal compartmentalization: main compartment for books or clothes, 2 mesh water bottle pockets, a bigger outer pocket for valuables and an organizer front pocket for miscellaneous. Rated best suitcase for kids, without a doubt! ​Particularly resistant, made of 100% polyester and reinforced with bottom protection mold. Particularly resistant, made of 100% polyester and reinforced with bottom protection mold. ​New bags require proper ventilation to remove the strong poly odor. The Adidas Defender II Duffel Bag takes the 3rd place in our series of best luggage for kids carry ons. A classy and stylized duffel bag, its offer is comparable with the one of the Rockland 2 Piece Luggage. But its 30 color combos actually come in 3 different sizes to cater the needs of your strong and independent kiddo. An addition to their daily sport or school bag, as well as an occasional travel duffel! A quick glance reveals the Adidas Defender II Duffel Bag as one of the most practical travelling bags for kids: 24 x 13 x 12 inches, 100% polyester, 3D ripstop, stand-tall shape for easy access. The 2 side pockets, zippered and ventilated with the small interior zip are great additions. Grab it by the padded haul handlers or by the non-slip shoulder pad, but just grab it. No wheels or backpack straps for alternative carrying. The Samsonite Wheeled Underseater Large model comes with a great brand reputation. Though it looks like a bag for adults, its 7.5 x 13 x 16 inches easily recommend it as best suitcase for kids. Unzip the hidden locking handle with push button or grab the special strap to slide it on top of another carry on and you’re ready to go. This carry on for kids, the Samsonite Wheeled Underseater Large bag, features 900D polyester and nylon lining with: front pocket with lots of zippered inner compartments, 2 side pockets for wet clothes, an inner hanging toiletry section removable with 4 snaps and more! That’s a sturdy, serious kids travel backpack for the independent kids. ​Fits, in general, under most seats, just like the “wheeled underseater” name suggests. Fits, in general, under most seats, just like the “wheeled underseater” name suggests. ​Some would appreciate having spinner wheels, for more flexibility when changing the direction. Some would appreciate having spinner wheels, for more flexibility when changing the direction. With the Stephen Joseph model, we move on to a more childish area of the best kids luggage selections. 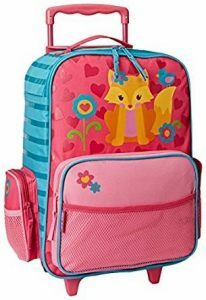 We’ve looked at a series of carry ons for kids with animals, butterflies, flowers, princesses, planes, dinosaurs and many others, but selected this cute, pink fox-themed rolling suitcase. Made of 100% polyester, the Stephen Joseph luggage is not exactly a toddler carry on luggage, as it measures 18 x 14.5 x 6.5 inches. It comes with one front and two side zippered pockets plus an extra inner pocket, all doubled by a mesh storage area. Excellent for girls (and boys, if you choose a different model) aged 3 to 9, it will cover all kinds of travel needs. ​All designs are colorful and bright, easy to spot in an instance even in crowded places. All designs are colorful and bright, easy to spot in an instance even in crowded places. ​Can only be hand washed, like many other traveling bags for kids. Can only be hand washed, like many other travelling bags for kids. The American Tourister Disney Luggage can make the best suitcase for kids that are raving fans of Disney characters. This soft-sided version pictures Darth Vader but you can always select something other than the Star Wars series - Frozen, Princess, Cars or Mickey Mouse, beloved themes of kids aged 3 to 8. The 18 x 12 x 7 inches polyester American Tourister Disney Luggage has a 24-liter volume. That’s half of the capacity of a typical adult carry on bag, sitting on two wheels. With the right amount of space, a handy large front pocket, side meshed pocket and all the cute details in all the right places, it’s one of the coolest traveling bags for kids. 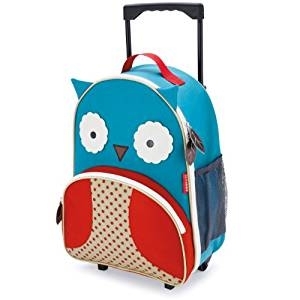 ​Quite affordable price tag compared to other branded carry on's for kids. Quite affordable price tag compared to other branded carry ons for kids. ​No backpack straps or pass-through back panel to secure it on top of a bigger wheeled luggage. No backpack straps or pass-through back panel to secure it on top of a bigger wheeled luggage. Another Stephen Joseph carry on for kids, this Stephen Joseph Classic Rolling Luggage, Monkey model makes for a solid recommendation of best luggage for kids. Compared to our 5th bag, the Stephen Joseph pink fox model, this one comes with a boy theme. Just perfect for your little champ to take it on both extended trips and overnight stays at the grandparents. The Stephen Joseph Classic Rolling Luggage, Monkey polyester bag measures 14.5 x 18 inches. Roomy on the inside, with accessible zippered and mesh pockets on the outside, it will turn packing into an exciting activity. Rest assured, the favorite toy and lots of other miscellaneous won’t remain behind. ​When fatigue takes over, parents can use the pass-through panel and secure it on their wheeled luggage. When fatigue takes over, parents can use the pass-through panel and secure it on their wheeled luggage. ​Zippers are known to cause problems to some kids. Zippers are known to cause problems to some kids. You’ve seen the name above, but this American Tourister Disney Hard Side Luggage is made of plastic. So, you get the same Star Wars theme that boys (and some girls) are crazy about, with a more durable case from 100% Abs Plastic and nylon lining. Don’t miss out on what may be the best rolling luggage for kids – for your kids! ​The 18 x 13 x 9 inches of the American Tourister Disney Hard Side Luggage are giving you extra space compared to the American Tourister Disney Luggage. The main compartment features cross straps and an internal zipper but your little boy will probably love it for all the special themed details. ​Works as a checking bag as well, thanks to the hard case. Works as a checking bag as well, thanks to the hard case. ​Somewhat small for the older kids, who are more passionate about Star Wars in general. Somewhat small for the older kids, who are more passionate about Star Wars in general. The Skip Hop Little Kid Luggage is the kind of kid travel backpack without… backpack straps. That’s right, it looks like a tiny backpack for a little person but it sits on a pair of wheels and gets carried around with a telescoping handle. From the entire zoo family that Skip Hop sells, we’ve picked this Otis Owl model first. The canvas-made Skip Hop Little Kid Luggage is BPA- and Phthalate-free, measures 7 x 12.5 x 18 inches and weighs 2.2 pounds. This carry on for kids features a 13-inch retractable handle and simple organization: a main zippered compartment, a smaller, external compartment on its front, and a side bottle mesh pocket. ​The parent strap stays hidden behind a special back loop, without the kid having to stumble into it. The parent strap stays hidden behind a special back loop, without the kid having to stumble into it. ​Some parents are not happy with the design of the adjustable strap. Some parents are not happy with the design of the adjustable strap. This Travel Buddies Luggage Set makes for a best suitcase for kids any way you look at it. 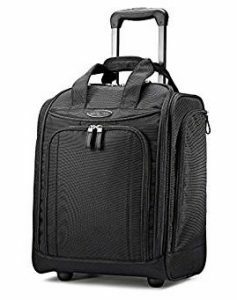 You have an 18-inch, 5 pounds wheelie suitcase with a matching 13-inch, 1.5 pounds hard-shell backpack. Both of them have polyester lining, dividing pockets, garment straps, and zip compartments, with some minor differences. The wheeled case of the Travel Buddies Luggage Set comes with both adjustable pull strap and carry handle that can be used by kids and adults alike. The backpack is a lightweight small bag with hard-shell case (ABS/PC-made), a small internal pocket, and adjustable back straps. While there are 9 different colors and funny characters, Percy Penguin is on top of kids’ preferences as best rolling luggage for kids. ​Comes with more than just one main compartment on the inside. Comes with more than just one main compartment on the inside. ​Some might even consider it easy to scratch. Some might even consider it easy to scratch. With the Trunki Ride On Suitcase, you’re the closest you can get from a toddler carry on luggage. But this is more than a best kids luggage option since you can use it as a ride-on, tow-along, and carry-on suitcase! Plus, it has an award-winning design to cater the needs of children even with their home play sessions. 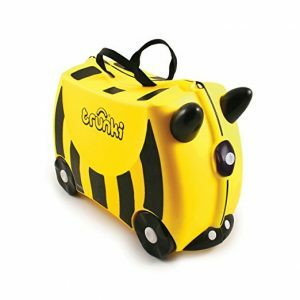 You can get the Trunki Ride On Suitcase in any of the 7 colors and 11 styles available, shaped as a bee, tiger, horse, cow, or even the beloved Hello Kitty. Expect it to measure around 12.8 x 18.4 x 8 inches and weigh 3.75 pounds. The light plastic case can tuck in a lot of items, ideal for the best suitcase for kids. And once you close it, you can grab it in a rush, by the carry handles, or have the kid ride on and steer the Trunky from its horn grips. ​Provides a comforting 5-year warranty. Provides a comforting 5-year warranty. ​It’s a risky choice for the energetic kids who might not sit and be towed for too long. It’s a risky choice for the energetic kids who might not sit and be towed for too long. Yet another cute Skip Hop model, this is the Skip Hop Zoo Little Kid and Toddler Travel Rolling Luggage – Monkey themed, unisex bag - the kind of carry on for kids that will make your child very happy, no doubt! Perfectly sized and organized, sturdy enough for short trips or adventurous journeys, this kid travel backpack is a must-have. 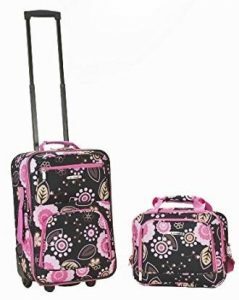 The entire suitcase of the Skip Hop Zoo Little Kid and Toddler Travel Rolling Luggage – Monkey weighs as little as 2.2 pounds and measures 18 x 12.5 x 7 inches. The poly-canvas fabric is not just BPA-free, but also sturdy. And the combo of main compartment, front pocket, and side mesh for the water bottle is pretty much anything a child will need. That and an adjustable pull handle, of course. ​The mesh water bottle holder will make hydration a breeze, without your assistance. The mesh water bottle holder will make hydration a breeze, without your assistance. ​Cannot be cleaned in the washing machine. Cannot be cleaned in the washing machine. Our best luggage for kids series features the Disney BB8 suitcase for its unique design. Before you say you’ve seen the Star Wars theme before… picture a 3D molded foam Darth Vader Mask sitting on a pair of rear wheels that light up through kinetic energy! That’s right, nothing like the soft-sided American Tourister Disney Luggage travelling bags for kids. This one will put a big WHOOOAAA on all the children’s faces. ​It also includes an ID holder pocket on the back, that the kid can sign. It also includes an ID holder pocket on the back, that the kid can sign. ​The small parts can pose perils for toddlers. The small parts can pose perils for toddlers. The Cabin Max Bear Luggage is probably the first kids travel backpack you’ve ever seen wearing… pants. But as a parent, you can already picture your child’s favorite teddy bear or doll snuggling in there. And with the added passport that the kiddo will personally sign in the name of the teddy, you won’t help but order it! 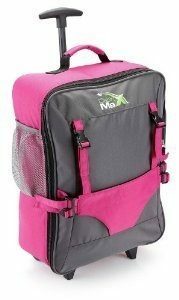 This unique Cabin Max Bear Luggage has a 34-liter internal compartment, with an extra inner zipper and an outer side mesh pocket. All in all, this carry on for kids measures 22 x 15 x 9 inches and comes in 7 different colors. It’s all you need to start packing for the next holiday with the children. ​Can also act as a stand-alone carry on with wheels. Can also act as a stand-alone carry on with wheels. ​No model is sold with the teddy and some would even lack the backpack straps. No model is sold with the teddy and some would even lack the backpack straps. This Hello Kitty Hard Sided carry on for kids is what you were probably waiting to see in our best luggage for kids selection. One thing that your girl must have taught you early on is that buying at least one Hello-Kitty-something is imperative. So, here’s your chance to buy a set of two! With the Hello Kitty Hard Sided set, you gain a 20 x 13.5 x 9 inches luggage with push-button telescopic handle and an 11.5 x 12.5 x 6 inches beauty case. Now, the latter is where the coolest thing happens, as the little girl will have a built-in mirror, just like mommy has in her purse! ​The beauty bag itself can be secured on top of another bag, with an elastic cross strap. The beauty bag itself can be secured on top of another bag, with an elastic cross strap. ​The price tag exceeds other, similar hard case carry on's for kids. The price tag exceeds other, similar hard case carry ons for kids. 16. Zinc Flyte Kids Luggage Scooter 18"
Briefly, with this Zinc Flyte Kids Luggage Scooter 18" rolling luggage, you benefit from a compact packing option and a versatile and unique carrying system. The oval-shaped hard case holds plenty of stuff inside, with its special compression straps. And the telescopic handle will come in handy whenever the kid will consent to get off the scooter. ​Can easily turn from a rolling luggage into a scooter with attached bag. Can easily turn from a rolling luggage into a scooter with attached bag. ​Possibly a bit heavy for some kids, with its 8 pounds weight. Possibly a bit heavy for some kids, with its 8 pounds weight. When you think you’ve seen it all, the GoVinci Trolley comes into play, on top of the most intriguing travelling bags for kids. Wherever you take it, it’s more than a luggage – it’s an opportunity for artistic stimulation (for the kid) and a chance to keep the child tranquil (for the parents). The 2.5 pounds GoVinci Trolley measures 15.4 x 10.6 x 5.9 inches. Despite its pretty standard format – similar to many kids travel backpack models, with a large interior storage space and a simple outer case – the frame on top of it is a cool thing for any budding artist! ​Boasts a smart design, giving the child easy access to the display frame, to personally handle it. Boasts a smart design, giving the child easy access to the display frame, to personally handle it. ​It’s a new model that hasn’t sold much, hence reliability is still to be determined. It’s a new model that hasn’t sold much, hence reliability is still to be determined. Thanks for a great list of options!